Activate the option “Accept Suggestion“ and the time suggestions from the fields shaded in grey on the right hand side will be applied. Here the labour hours can be adapted to the individual need. For a detailed overview of the time suggestions click the button “Time Suggestions Info” on the left hand side. Here you will find an itemisation of the labour hours. The data can be exported to an Excel file. For this purpose click the button „Excel“. 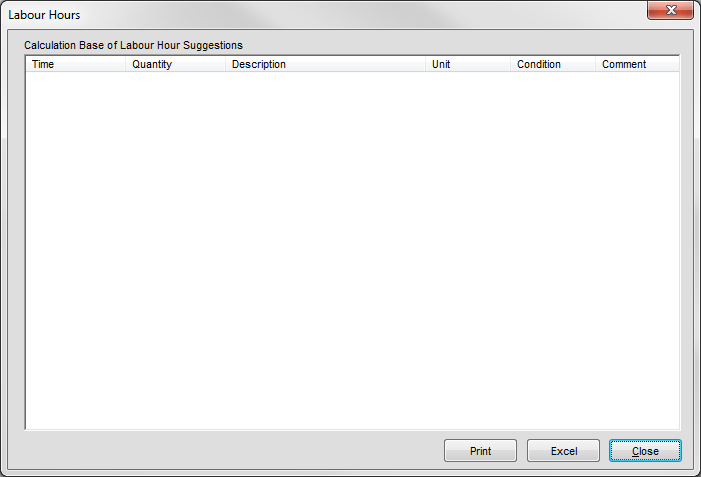 You can determine the name for the calculation of labour hours as well as the labour hours default yourself. 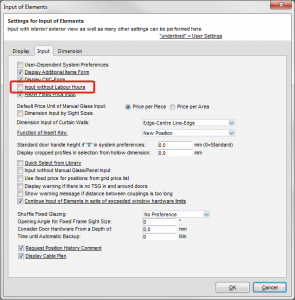 Click “Settings” → “Additional Settings” → “Labour Hours” in the project centre. In the area marked “1” you can enter a name of your choice. This will be shown later on in the input of elements under “Additional Data”. 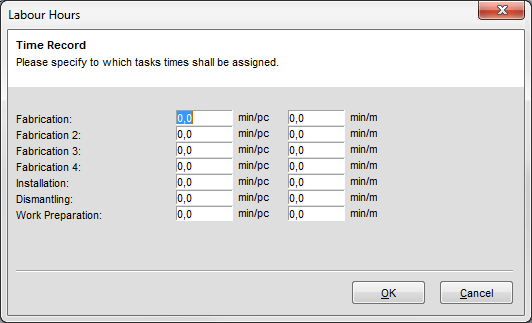 Furthermore there is the option to mask out entries or to transfer the time suggestion of individual fields directly. 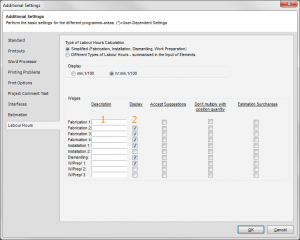 In the upper area of the menu you can have a simpler overview displayed under “Type of Labour Hours Calculation” with the option “Simplified”. With the option “Details” you get a detailed breakdown of the calculated labour hours in the “Input of Elements“ under “Additional Data“ → “Time Suggestions Info”. 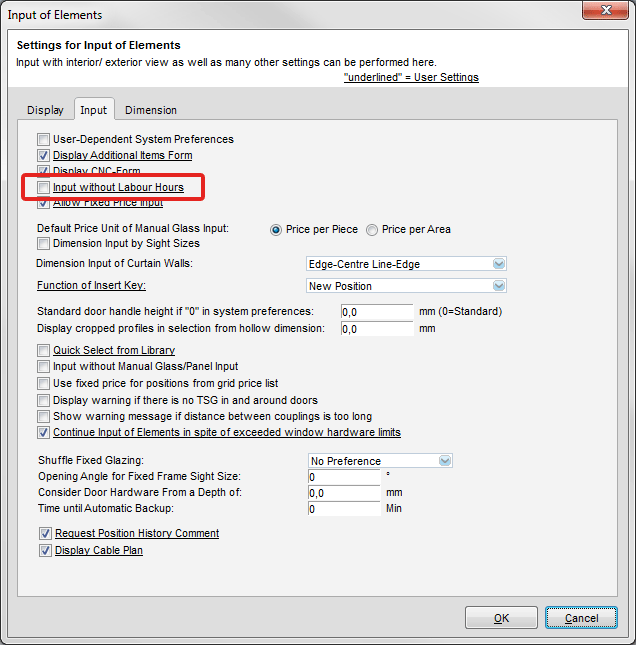 Note: For technicians using the programme exclusively to draw, you can mark the check box “Input without Labour Hours” under “Settings” → “Input of Elements” → “Input”. Under “Input of elements” → “Additional data” this function masks out the labour hours for the particular user. 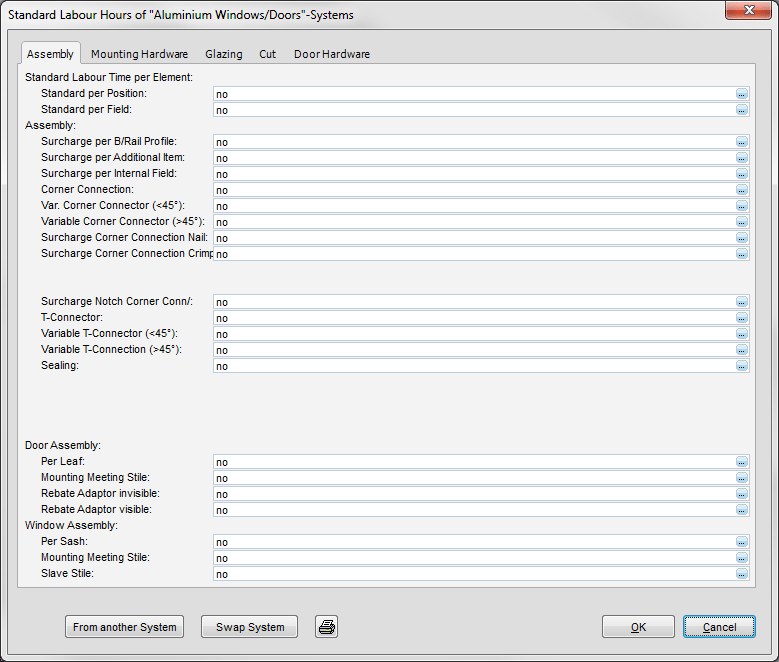 To enter labour hours return to the project centre, select “User Database”, and the option “Labour Hours”. Labour hours are divided into “Standard labour hours” (1) and “System-based labour hours” (2). 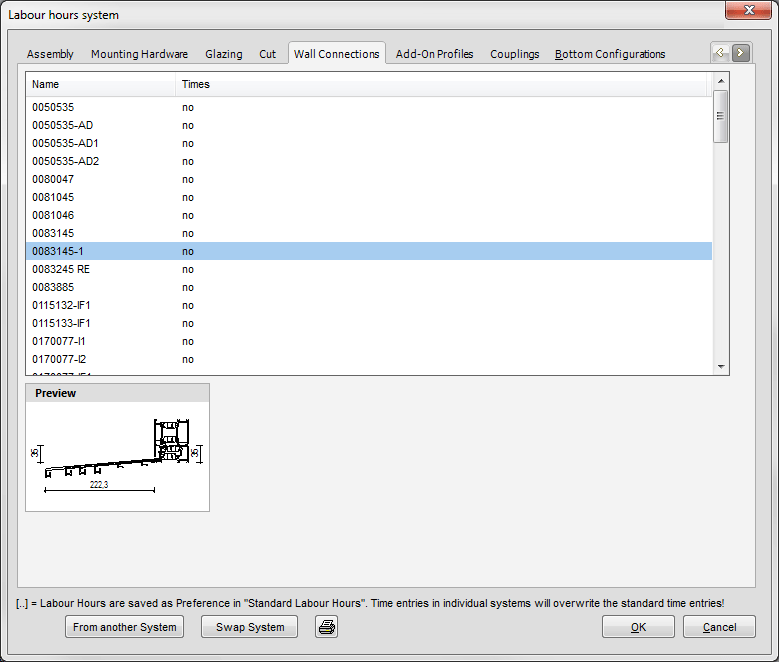 In “Standard Labour hours” system-independent labour hours such as corner and T-connectors can be entered. 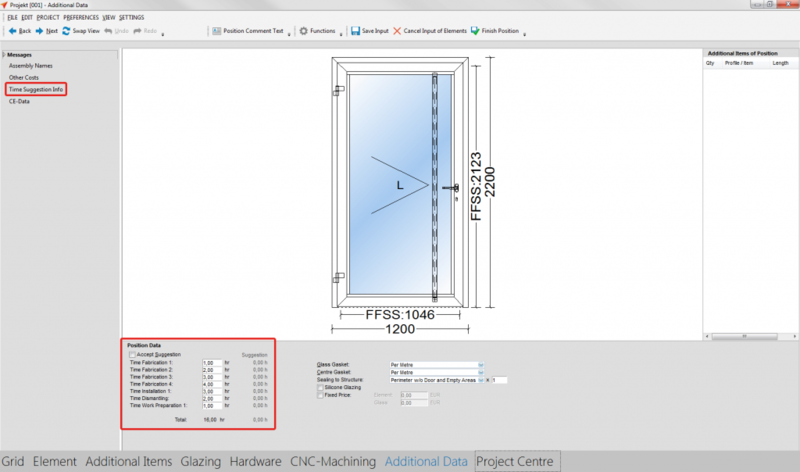 In addition system-based labour hours give you the option to enter labour hours for couplings, add-on profiles, and wall connections. 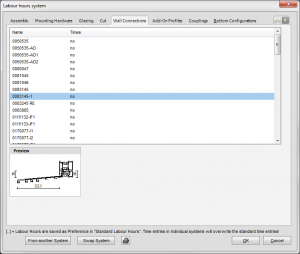 Note: System-based labour hours overwrite standard labour hours provided that they have already been entered. To make timekeeping even more flexible (e.g. 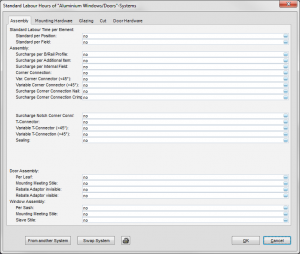 for hardware) there is the option to assign individual items to separate labour hours under “System Items” in “User database”. 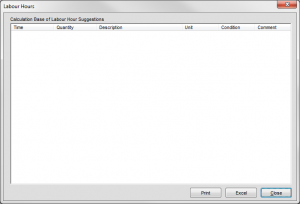 These entries again overwrite the entries from the standard and system-based labour hours. 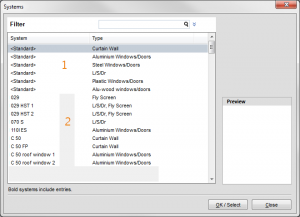 Furthermore you can enter the labour hours for bottom configurations, wall connections and roller shutters under “System input” in “User database”. 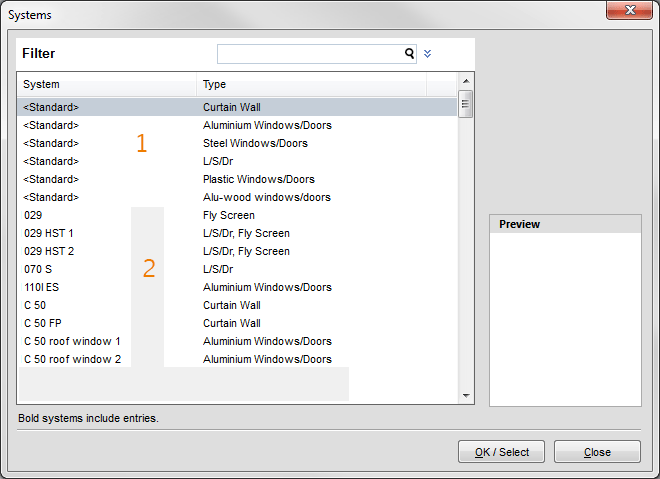 Items entered under “Additional items” in the input of elements can also be entered with separate labour hours.